For what purpose do I hear you cry? What is my sudden urgent need for the way of the petri dish and test tube after years of wanton neglect? Science, my needs are simple but they are magnificent; I need you to clone a cheese pasty. But wait. Hold on. Don’t turn away with a tut and a swirl of your pristine white lab coat (for one it’s dangerous in a lab with so many open flames and glass equipment). 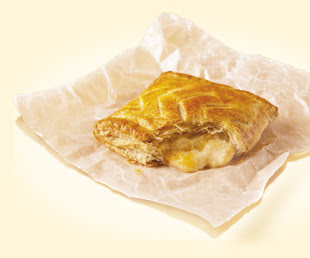 This is no ordinary fromage-filled baked savoury product – this is a Gregg’s three cheese and onion pasty. ‘Hold on there Mint Custard my dear chap’, I hear you say, ‘cloning of a pasty? Why don’t you just buy one?’ 'Well, like, duh, I eloquently retort – they don’t sell Gregg’s pasties in Australia do they? If they did I’d be happier about 17% more of the time and an equivalent amount wider in the waist. If they did I wouldn’t pine for them like a newborn puppy separated from its mother. If they did I wouldn’t beg overseas visitors to try and smuggle them back in their hand luggage – because even a 24-hour old cold Gregg’s cheese and onion pasty that’s been squashed under a mountain of duty free plonk and used travel stockings is still better than any pasty in Australia. And of course it’s illegal (no, thank you over-zealous Australian quarantine laws) which means that no one ever tried – until now. Kind of. Because one kind soul at my work who happens to hail from the North East took pity on me and, doing the best she could, successfully smuggled her used pasty bag on the plane after indulging in some last minute snackage at the 24-hour Gregg’s at Newcastle airport. But the news, dear science, is that the bag WAS NOT EMPTY. Buried in its depths was a luxuriant amount of slightly crusty illegal pasty crumbs. In short, pasty DNA. Now I may have no idea how science works, but I have been Questacon and more importantly I have seen the important bits of Jurassic Park (though not the whole film because I got scared of the velociraptors). If Richard Attenborough can clone a walking crunching biting dinosaur then surely science, surely, I can indulge my baked-turophilia down under? Science, I may have shunned you aged 16 for the allure of the language lab and the promise of attractive mademoiselles but now I recognise the error of my ways and come crawling to you cap in hand begging for your nerdy expertise. Help me. Scientists of the world, hear my plea. Join with me and together we can share melty cheesy pasty goodness. * I did try and think of some famous fictional lady scientists but as already explored by Astrodyke there aren’t any really… are there? Boo.. I could access one of these ...er, things for you, but I've no idea how it would transport. (You English and your cheese and onions, this is something no other nationality could possibly understand) Round here it's all a bit Cornish anyway, are Greggs regionally sensitive? Somehow I don't think so. Just get yourself some Pampas puff pastry - it's ready rolled! Don't forget Professor Wiseman from the Curious George cartoon!